Lots of authors write memoirs and autobiographies. Some of these are even aimed at children–Beverly Cleary’s A Girl From Yamhill comes to mind. But how many authors write a picture book memoir? 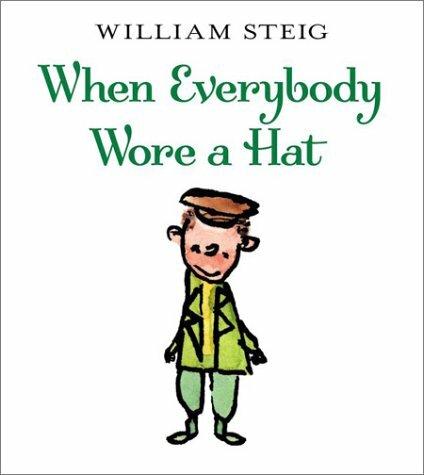 and everybody wore a hat. On your birthday you might get a nickel. In those simple paragraphs are about 5 state standards for social studies and some main concepts we’re trying to teach in the General Store exhibit at the museum (and working on for the Bank exhibit). Brilliant! But there are also illustrations of his parents arguing, his father threatening the radiator with a hammer, and his brother sick in bed. There’s a reality and a harshness to these illustrations that I adore. It makes his story seem more real. I wish there were more picture books like this. And perhaps there are–I will confess I’m not as familiar with history-centered picture books as I am with the chapter books. But for now, I’m thrilled to add this one to my arsenal of kidlit history. From my archive. . .
My favorite introduction for a Christmas gift: I saw this and instantly thought of you! That’s when I know, almost without a doubt, that it’s going to be good. It’s also a phrase that I rarely hear from my family. . . Anyway, one of my coworkers said this to me the other day, and sure enough, this is the best Christmas gift so far! 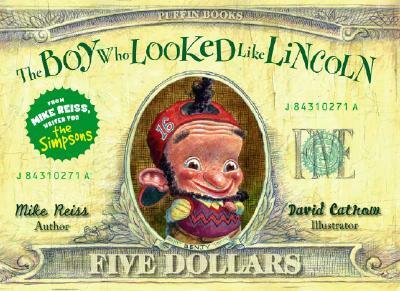 It’s a children’s picture book: The Boy Who Looked Like Lincoln, written by Mike Reiss, a writer for the Simpsons. It’s all about a little boy who (surprise!) looks like Lincoln and the fact that he gets teased all the time. Until he goes to Camp What-Cha-Ma-Call-It, filled with other kids who also look like odd things. My favorite part: at the end, the school bullies say “Hey, Lincoln, whatcha thinkin?” And he says “I’m thinking how lucky I am to look like Abe Lincoln, our greatest president, who freed the slaves and won the Civil War and kept our country together and the capital of Nebraska is named after him!” Of course, that little sentence is written in progressively larger letters. It’s a giggle worthy book, definitely worth reading in the aisle of your favorite book store (or buying the book (that could be good too). Folks, I still adore this book. A few years ago, we did an exhibit on the 1860 election and I picked this book for our preschool story-time. Reading this to a group of kids and their parents was so much fun! I don’t talk about picture books very often here, but this is a great one to nurture a love of Lincoln in a little one. That, and a sense of humor. Certain picture books from my childhood firmly planted roots in my mind. Are You My Mother? Laurie and the Yellow Curtains, Lady (an adaptation of Disney’s Lady and the Tramp) And then there’s Virginia Lee Burton’s The Little House. I remember gazing at Burton’s wonderful illustrations and her wonderfully personified house. I always felt so sad when the city grew up around her and she was no longer loved. But there is a happy, satisfying ending–that made me want to rescue other little houses. Now that I”m a museum educator, I’m always looking for picture books that talk about history that aren’t boring and dull. It is continuingly amazing to me how bad some books are that are supposed to get kids to like history. 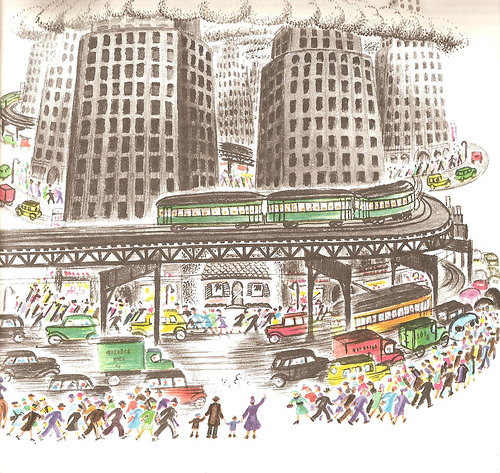 There is something to be said for Bobbie Kalman’s publishing empire–they’re beautifully illustrated, well-researched and do manage to answer a lot of frequently asked questions about history. But they’re boring. No clever hook. No story to grab little hearts and minds. No characters to fall in love with. So I’m continually on the lookout for picture books that can worm their way into little brains so that they won’t realize how much they like history until it’s too late. The Little House is on my list. Nothing else does such a good job of showing that classic history lesson of “change over time.” And how can you not fall in love with the little pink house? A few weeks ago, I picked up an illustrated biography of Virginia Lee Burton by Barbara Elleman. About 90% of the reason I bought it was my love of The Little House. I squealed to a friend. She was confused. It’s not like this is horribly unusual. I’m not quite halfway through it. Though it’s a fairly standard biography, the collection of photos of Burton (she was so pretty! ), her illustrations, and life at her house, Folly’s Cove, makes it well worth the money. And then I read this little tidbit: “The house, which originally set close to noisy Route 127, was moved back onto a gentle-knoll in an apple orchard.” Burton’s house was The Little House! Well, not exactly–apparently, the inspiration was a “two-storied, slant-roofed building, with gray shingles and lemon-colored shutters.” Sigh. But Burton was definitely trying to “convey the idea of historical perspective, or the passage of time, in terms comprehensible to a child.” She was not a fan of progress for the sake of progress, which is certainly reflected here. Burton felt that smaller was better. She also established a group of artists that designed fabric, harking back a bit to the Arts and Crafts movement of the early 20th century. The Little House was first published in 1942. Though cities had grown dramatcially in the first half of the 20th century, the suburbs of the post-war era were yet to come. This story is still so timely as we continue to struggle with urban sprawl and small towns becoming big city big box suburbs. And it’s a story that kids still seem to connect with–it’s about history, but it’s sneaky. I like sneaky. Though the other Little House books certainly helped develop my love of history, I do wonder if The Little House might have been even more fundamental. After all, look at where I work today–a museum full of buildings moved out of the way of “progress,” now set in the shadow of the city. It just keeps coming up. . .